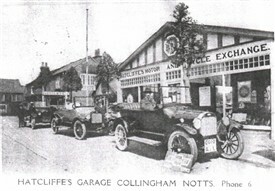 This photo shows Hatcliffe's garage in Collingham in c.1921. Harold Hatcliffe is listed in Kelly's 1912 directory as a Tobacconist; then Tobbacconist, Cycle and Motor dealer in 1916. 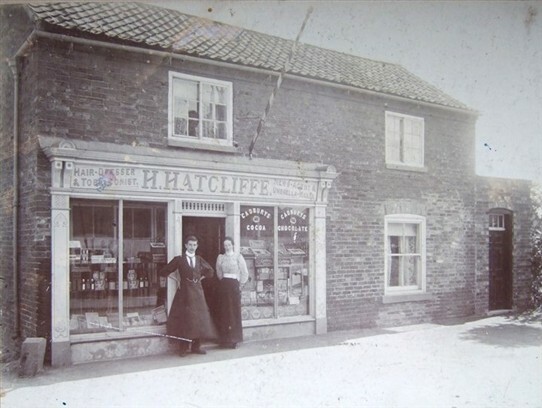 In Kelly's 1925 directory the garage business has passed into the ownership of Harry Challans and Mrs Myra H. Hatcliffe is a Grocer, Confectioner and Stationer: one wonders whether Harold Hatcliffe had died. Our expert on old motor cars, Brian Waters writes: The card propped against the front wheel of the lead vehicle advertises Chevrolet cars, and, indeed, all three cars in the photo are Chevrolet four-seat tourers, brand new and unregistered. I put the date at circa 1921-22. Chevrolet cars were imported from the U.S. in considerable numbers from about 1910, even during the 1914-18 war, and through into the 1920s. They were mass-produced for a vast market in the United States relatively cheaply, but to a high standard. Even with import costs they sold well in this country, being of good simple design, easy to drive, with good performance and needing just basic maintenance. Sales suffered later when the RAC horsepower rating system was introduced for road-taxation purposes, because the cars had large easy-running engines, and were given a high tax-rating. The registration plate 0010 AL is an example of a trade registration plate. 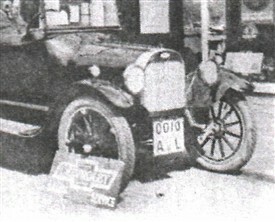 Trade-plates were introduced in 1904 and were available on request to motor-dealers and garages. They were issued one pair of plates per business and were attached temporarily to new vehicles when on demonstration or road-test, to give them an identity on the road before issue of the permanent registration. From 1921 all trade-plates were standardised to have red characters on a square white plate. They had three or four numbers followed by one or two area code letters. The suffix AL identifies it as a Nottinghamshire county registration. The plates were numbered in order of issue, starting at 1 and always had one, two or three lead zeros. So 0010 seen here is quite an early one. Trade-plates are still in use today and some are of early issue. When I worked at W.Donald Ltd. in Newark the 1950s we were still using 0032 AL. This page was added by Website Administrator on 28/08/2015. 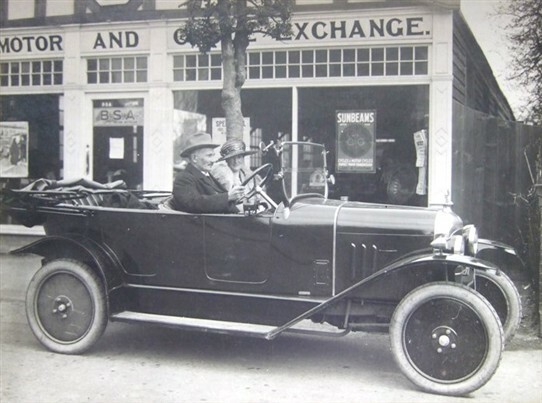 The Chevrolet Showroom and Garage was owned by Mr HERBERT Hatcliffe, who bought the adjoining property in 1898 and started out as a 'hairdresser, tobacconist, confectioner and circulating library' (Kelly's 1904). 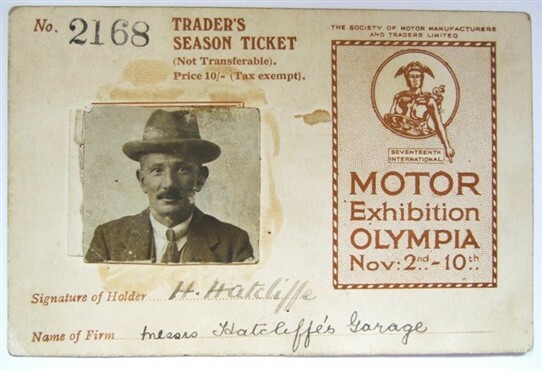 Hatcliffe became a cycle and motor agent by 1916. The showroom was actually a temporary hospital hut from a WW1 army or RAF base (according to the current owner, Dennis Thacker). There is still a garage to the rear but the 'showroom' is now used for storage only. Mr Henry CHALLAND took over from Hatcliffe c 1924 or 1926 (sources vary). Hello, Brian. I'm sure Collingham History Society would be interested in this. I often wondered what happened to the Hatcliffes as they were very influential in the village. It would be super to have more info on them. Do contact me via the administrator.